Are printed on modern, high quality printers meaning we can dispatch them in super quick time. The material is a fabric similar to our iron on labels, meaning once they are sewn on they become silky smooth and are especially suitable for sensitive skin. 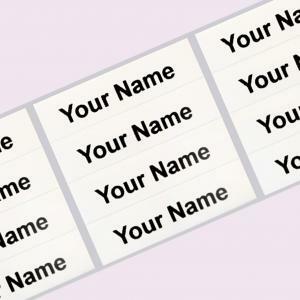 To order simply insert the name you want on the labels, choose your favourite image (or leave blank), select the colour and then decide on the quantity of printed sew on labels you'd like to order. All our printed sew on labels ship the same day (orders before 2pm weekdays) with FREE UK delivery as standard. A LIFETIME guarantee provides peace of mind. 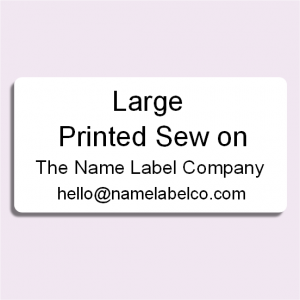 Woven sew on clothing labels give a classic finish to any garment. They do take a little longer to produce (5 to 8 working days) though, as they are crafted on traditional looms. 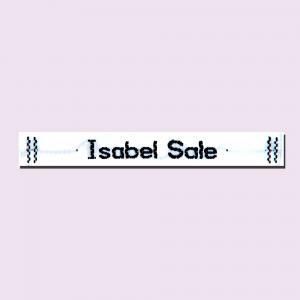 To order simply select the colour and size label, insert the name you want, then decide on the quantity of woven sew on labels you'd like to order. Our woven sew on labels ship within 5 – 8 working days with FREE UK delivery as standard. A LIFETIME guarantee provides peace of mind.